March, 2019, Iqaluit.- Nunavut Arctic College would like to congratulate Dayle Kubluitok for winning this year’s NorthwesTel Directory Cover Art Competition. Dayle joined NAC’s Marketing & Communications team as a Promotional Materials Specialist in March 2019 and we are lucky to have such a talented young artist as part of our staff. Dayle Kubluitok’s digital artwork Four Corners, inspired by the intersection in downtown Iqaluit, is featured on the cover of Northwestel’s new phone book for Nunavut. A young artist in Iqaluit has won this year’s Northwestel Directory Cover Art competition. Dayle Kubluitok’s digital artwork, Four Corners, inspired by the well-known intersection in downtown Iqaluit, was officially unveiled March 8 in Iqaluit as the cover image of Northwestel’s 2019/20 phone directory for Nunavut. For more than 30 years, Northwestel has invited northern artists to submit their work for a chance to appear on its regional phone directory covers. Northwestel selects the winners in consultation with the local arts community. Each regional winner receives $3,000. 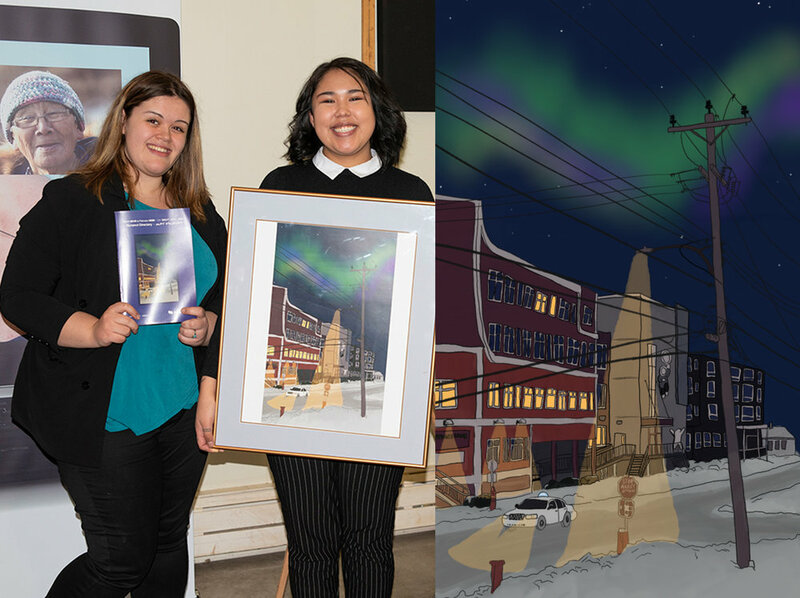 A first-time entrant, Kubluitok recreated the downtown Iqaluit intersection by using her smartphone to digitally sketch the scene, then added colour and shadows using a graphic design tablet at home. Originally from Rankin Inlet, Kubluitok briefly attended art school at Centennial College in Toronto, but returned to Nunavut, due to the high cost of education, she said. Now living in Iqaluit, Kubluitok has received commission requests and just started a new graphic design job with Nunavut Arctic College. Northwestel President Curtis Shaw said he is excited to see new types of artwork coming from a new generation of northern artists. The new 2019/20 directories will be available at pick-up locations throughout Nunavut in the coming weeks. From now until April 26, last year’s phone directories can be recycled to support local students through Northwestel’s Directory Recycling Program. Each year, northern students can collect these old telephone directories for recycling to earn money from Northwestel to help fund school activities. Details about the program, including a list of participating schools, are available here.